Hello and apologies that there has not been a post for the past two weeks. I have been back in Scotland to visit family and to attend the wedding of one of my closest friends. I left Hong Kong with great intentions of continuing my weekly posts whilst I was away but as soon as I got home, jetlagged and exhausted from traveling on my own with Little Whisk, I decided that it was time for a social media and screen break. It was the first time that I had been back home in over 18 months, and although the freezing temperatures were a shock to the system it was wonderful to be home and a real treat to enjoy my mum's cooking. As I mentioned in a previous post my intention this year is to bring you more easy, quick, weeknight recipes. So often I hear people say that they are too busy to cook during the week, but I think with a bit of planning, and the right recipes, it needn't be a chore to have nutritious home cooked meals every day. This recipe is adapted from a wonderful recipe featured on one of my favourite blogs - www.themodernproper.com. I would definitely recommend checking out the blog as there are wonderful recipes and beautiful photography. Instead of chicken I have used chorizo in my incarnation of the recipe. I love chorizo because it is so flavoursome and from a practical point of view it has quite a long shelf life so is ideal to keep in the fridge for a quick dinner. 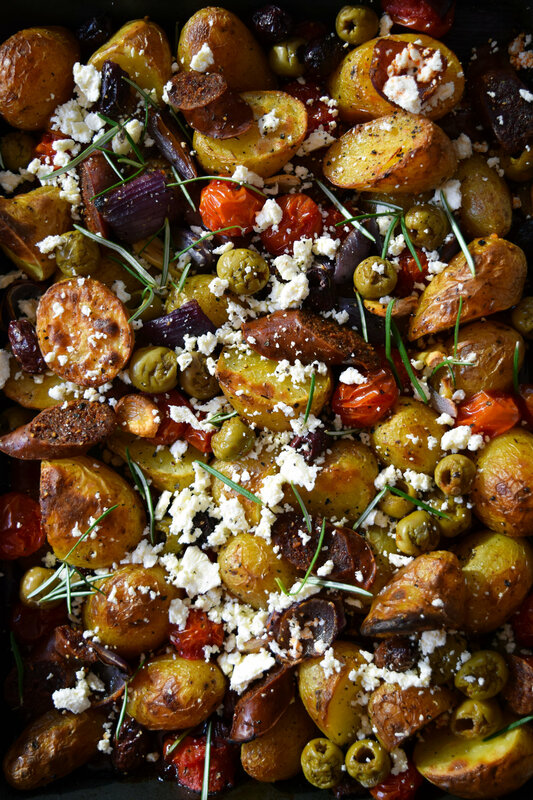 I love the combination of the chorizo, feta and olives, the dish is just bursting with flavour! Put the potatoes into a baking tray that is at least a 2cm deep. Drizzle over 2 tbsp of olive oil, season with some salt and pepper and toss to coat. Place the tray in the oven and cook the potatoes for 15 minutes. Remove the tray from the oven and add the chorizo, olives, garlic, red onion and remaining olive oil. Stir with a spatula or wooden spoon to mix thoroughly and to coat everything in the oil. Spread across the tray so that everything is quite tightly packed. distribute the cherry tomatoes evenly across the top. Return to the oven for a further 25 - 30 minutes or until everything is cooked through. Remove from the oven and crumble over the feta cheese*. Delicious served on its own or with a simple salad. *Tip - use the back of a fork to quickly and effectivly crumble the feta.